Our backyard gets visitors periodically, even though it's fenced as a dog run. They (the Javelinas) systematically uproot dozens of mamillaria cacti and eat the roots. So we pick up the buds and put them into sand-filled pots to reroot, then plant them for the next invasion. To get at least something out of it, I made the whole party pose for a painting. Even though they look deceivingly similar to wild boars Javelinas or Peccaries are only distant relatives of pigs. Taxonomically they are members of the same suborder, Suina, but are in their own family, Tayassuidae (New World pigs). They sport two pairs of big canines as opposed to just one in Oldworld Pigs. But like pigs, they live in family groups, and root for their food with very similar snouts. As ours live in the desert, I never saw them enjoy mud baths, but our Arizonan, New Mexican and Texan Javelinas live at the northern most tip of their distribution area which reaches all the way south to Argentinia. So they must use many different types of habitats. They are territorial and use skunk-smelling secretions of their scent glands (below each eye and on their backs) for marking and communication. If hunted for food, these glands have to be carefully and immediately removed or the meat is spoiled. I have eaten jerky and fresh, grilled tenderloin as guset of Mexican gold miners and it was very good. Javelinas are rather nearsighted and also quite fearless, which results in frequent close encounters between them and human and caninen Arizona residents. Often the Javelinas just go quietly about their business. While house-sitting in the Tucson foothills at First Avenue, I once found myself surrounded by a herd between garage and patio. They were so peaceful that I reached out to touch the big patriarch when he walked close to me. He screamed with indignation and bristled. Other people have been less lucky, and those big canines leave bad wounds. My 40 pound Healer-type dog Bilbo got into a fight with a single Javelina last year, and he came away from it with a big, gaping chest wound. But at other times my dogs have cornered the entire resident herd including young ones and nothing happened. With Javies, you just never know. So don't ever feed them, not even inadvertently by keeping garbage or compost in accessible containers. The more the 'desert pigs' get habituated to humans and their houses, the more confrontations happen, and those usually end with killing or removal of the javelina herd, and our desert is all the poorer for it. Why is the sting of Velvet Ants so painful? But the name cow-killer (a total exaggeration) and the bright aposematic colors of these insects that usually lead very unobtrusive lives on the ground, among sand and rocks, do hint at a potent weapon. Justin Schmidt ranks their sting high in his sting index. High on the pain scale, but very low in duration or tissue damage. 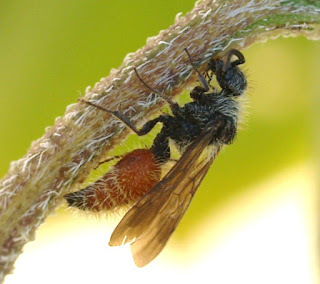 Among wasps and bees, most painful and harmful stings evolved in species that prey on very big, active and potentially dangerous prey that they send into an extended period of paralysis (tarantula hawk), or in social insects with lots of resources to defend. 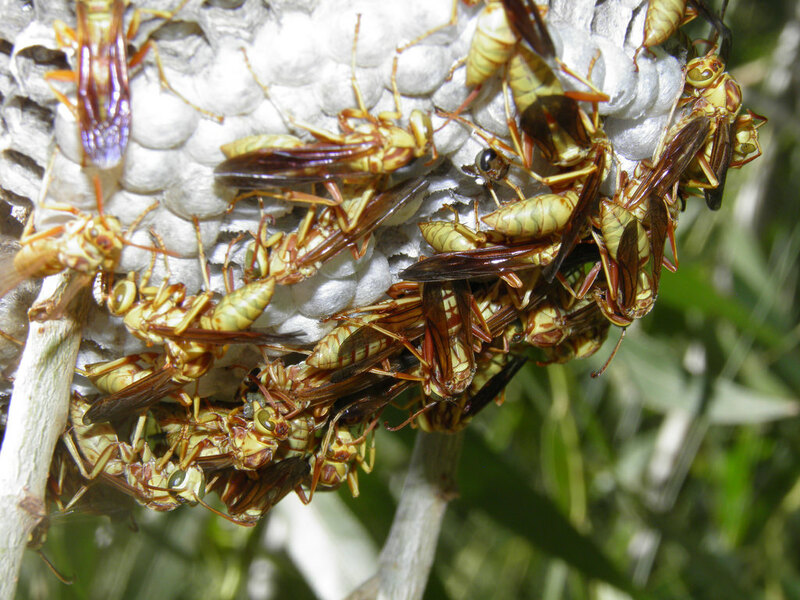 Nests of social wasps, bees and ants are sought after by many enemies because those nests offer a quite unique accumulation of proteins and carbs. Where else could a bear or a human village harvest honey, pollen and larvae by the bucket? Of course, those social hymenopterans defend their riches with whole armies of rather expendable workers. The sting of these amazons is painful and often even harmful (tissue damage and central nervous effects) making sure that lessons are taught and remembered. Pogonomyrmex sp. 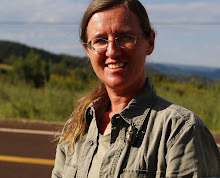 Harvester ants, Fire Ants, Honey Bees, Yellow Jackets and Hornets are examples that most people know. Mutillids are neither social nor do they store larval food or even have their own nests. Their larvae develop as Ectoparasitoids of immature insects, esp. bees and solitary wasps (also flies, limacodid moths, beetles, and cockroaches). So the mutillid wasp is not guarding or defending those nests or larvae. There are many other solitary wasps like Scoliids, Cicada Killers, and Mud Daubers etc. with comparable developmental histories that are not known for an especially painful sting. 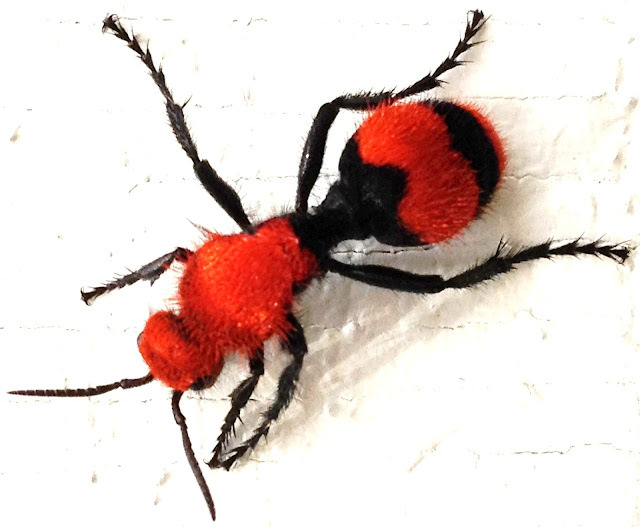 And there is even more to the defense system of Mutillids: Velvet Ants squeak (stridulate) when grabbed or otherwise trapped - I know that from a male that crawled into my husbands ear while we were reading in bed - To me it sounded like Micky mouse and Donald duck got into an intense argument in his ear-canal. Some species of mutillids also release chemical defenses when caught. In addition, all of them, winged males and fast-footed females, are so heavily armored that they survive unharmed when swatted at or stepped on - even when chewed on by a naive predator I assume. This extra strong exoskeleton must be costly to build and heavy to carry. Justin Schmidt also mentions that the legs of a female mutilid are about as strong and muscular as insect legs can get. That's easy to believe when you see them running. So these wingless wasps have a defensive arsenal that is not equaled by many other insects. So why? Schmidt suggests a reason in his book The Sting of the Wild: Longlevity as a strategy. The majority of insects has a very short adult life span. After mating, females of many species lay hundreds of eggs in one big clutch on a host plant and then die. Even big wasps like Cicada Killers that provide food for their offspring don't live much longer than 40 days. 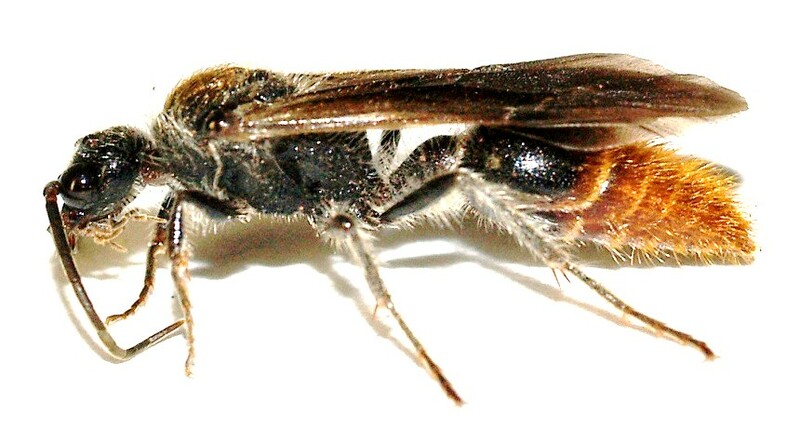 Mutilid wasps are parasitoids of solitary bees or wasps. Their arid habitats are bare and thinly populated by any host species. Mutilids procreate by placing single eggs into late instar larvae or pupae of their host species. So even if the female Mutilid finds a leafcutter nest with a series of larval chambers, there might only be one or two that fits her requirements. So her egg production may be strung out over a long time and depends on her searching for just the right situation to lay one egg or a few. This is possible because her adult life span, amazingly, is longer than a year. This longlevity ensures that the female has time to place enough eggs to guaranty the survival of the species. The arsenal of defensive weapons provides the means necessary to survive that long. Thanks to Justin O. Schmidt for his excellent book 'The Sting of the Wild' John Hopkins University Press 2016, for including my Mud Dauber, and for great company in the field!